How I did with my Friday list – words and photos galore. I did everything on my Friday list! It has been a long time since that happened. 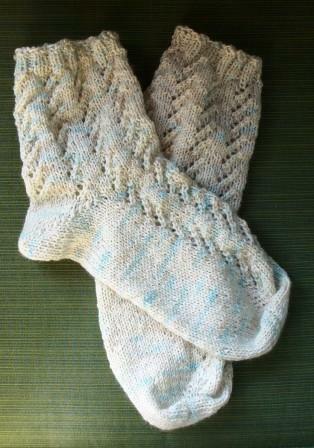 I finished knitting it Friday afternoon and blocked it. Today it came off the foam board. I love it! 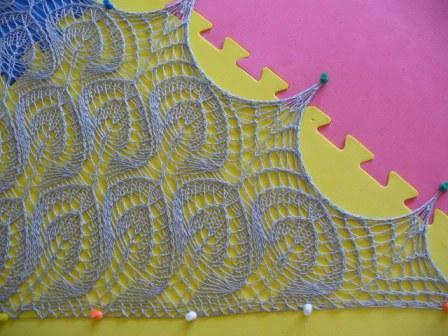 It always amazes me how lumpy thick, small pieces can be totally reshaped and come out as fabulous lace. And got this out of it! 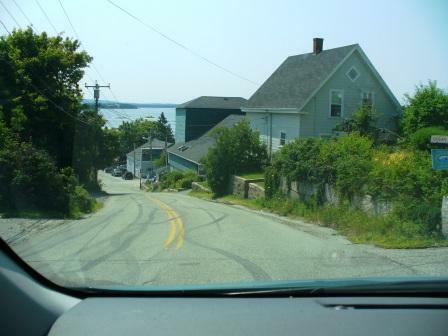 I love going to Stonington. You might remember that I went down there last winter to do some free tax prep? It was cold, bumpy and desolate. Yesterday? Not so much. 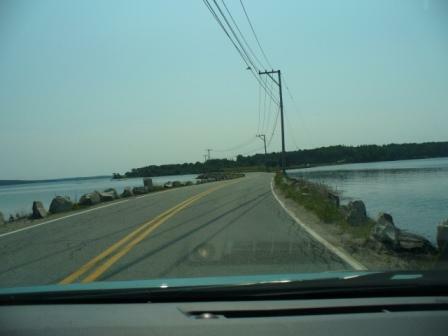 Here are some photos I snapped along the way – some through the windshield, sorry they are blurry. 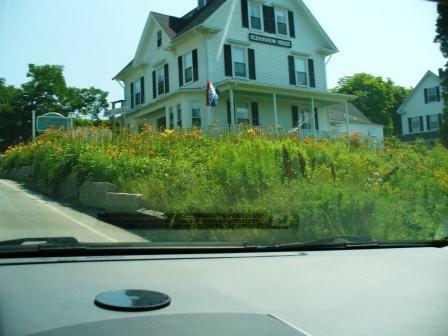 Stonington is about an hour away – down a long peninsula with fabulous views of the islands and Penobscot Bay at various points – and some pretty flowers, too. 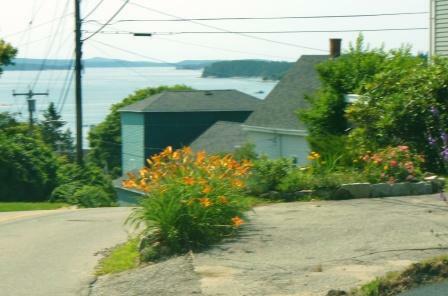 I always think of roses and day lilies when I think of Stonington in summer. 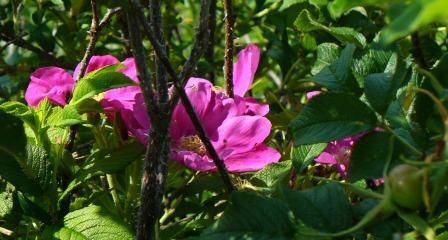 There is nothing like the smell of the flowers, the pines, and the ocean. Just heavenly. This is a blueberry barren along the way down the peninsula – there was a lot of blue showing, but not in the photos – almost harvest time! 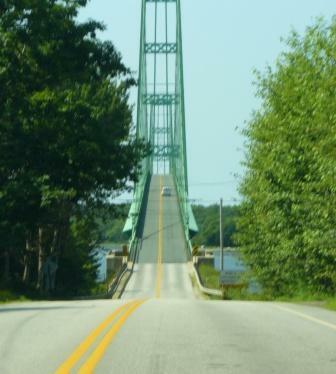 Then, you have to take the serpentine causeway to get to Deer Isle, which has two small towns – Deer Isle Village and Stonington. 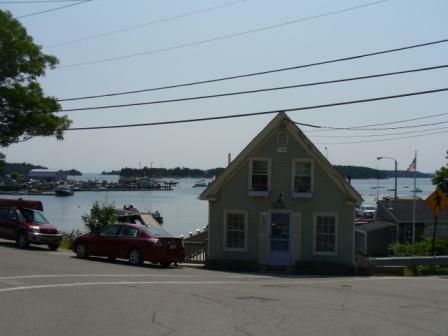 Stonington is at the tip of the island. 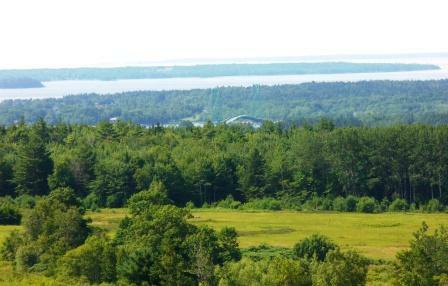 It is perched on a big hill of granite at the edge of Penobscot Bay. I just love all the wooden houses perched on the edge of the earth, and the beautiful gardens. Isn’t it pretty? 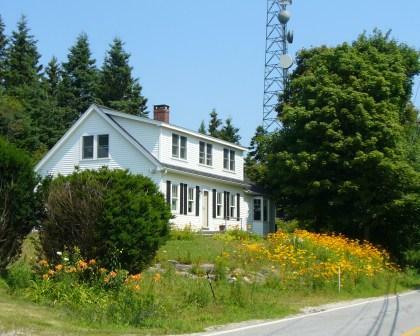 Even that cell tower is pretty with all the black-eyed susans blooming in the garden beneath it. Coming home, I took a moment to snap a photo of one of my favorite places – this barren is one I drive by every day to get to work – I love that stony field with the lone tree. 🙂 Appropriate that this is through the windshield as that is how I always see it. 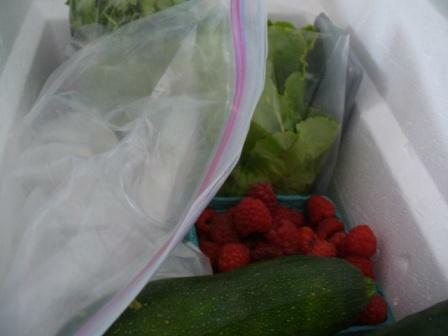 And oh yes, I did remember to go to the market while I was in Stonington – got some delicious cheese, chocolate, veggies and raspberries. Deliciousness. 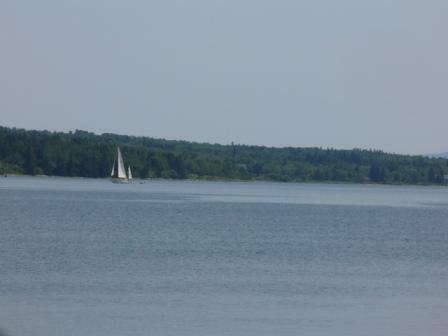 Author salpal1Posted on July 26, 2014 Categories how I spent my day, what I am makingTags farmers' market, knit, off the needles, photos, road trip, socks with Sarah, Stonington, summer day, to-do list13 Comments on How I did with my Friday list – words and photos galore. 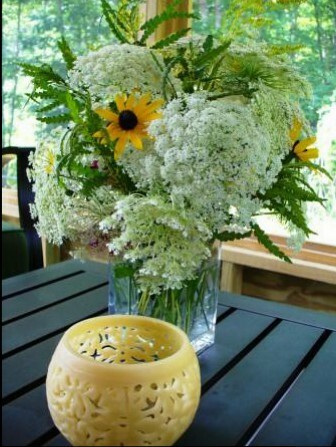 Just a short one today – I am bound and determined to go to the Farmers Market in Stonington. Still have not made it there yet this summer. Their blog posts keep telling me all I have missed, so today, I will go there. 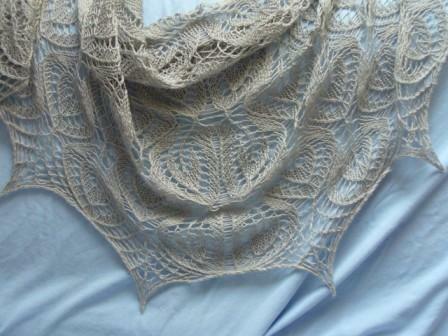 Also, want to finish the shawl which is so close to done! I ran out of yarn, so had to rip back one pattern repeat. However, because there were lots of notes to this effect on Ravelry about this pattern, I had several lifelines in, so that was pretty easy. Not sure if I have updated you on the whole pool excavation thing lately. I have decided that this summer will be pool-free. It was a tough decision to make, because you know I love my pool, but it just wasn’t happening as it should. Instead, this is the summer of prepping for next year – I continue to work on the digging in short spurts, and hope to have everything ready for next spring. I made this decision when I thought about just how much water will go into this thing, and how long it will take to fill it – it would be September before I could use it, and September is usually when I drain it! That seemed a waste of water, so I decided to release myself from the pressure of the goal. I’ll swim at Mom’s, or Craig Pond if I feel the need for a swim. That’s it – 2 things. More might happen, but I sure hope that I can get these two things done! Just wanted to let you know why it has been so quiet, and that the silence will end! 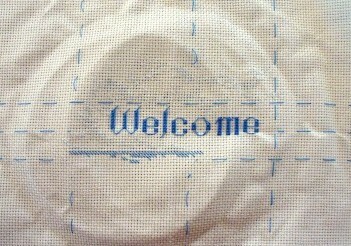 Weekend was wonderful – good combination of work, crafting, resting and relaxing. But in all of that, I spilled a glass of juice on the laptop! I shut it off fast. Stood it on its head and wiped up the resulting mess. Wiped down the keyboard and screen. Left it off for two days. Turned it on this morning and all is well. Not sure how sticky things are inside, I hope I got it cleaned up fast enough. 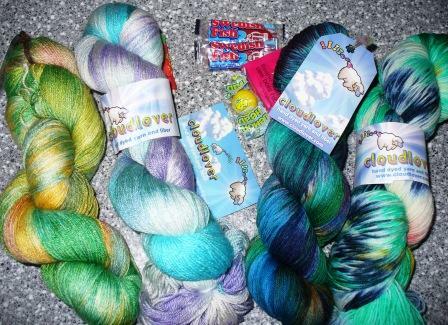 I was excited to get this in the mail Friday – 4 skeins of delicious yarn, ordered with the Socks With Sarah Discount – yummy softness. I guess I was in a blue and green mood when I ordered, huh? So cute that she included a few extra treats! 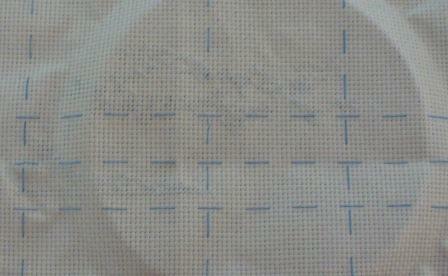 I started a cross stitch picture for my brother and family, to celebrate their new house. I am taking periodic photos so that you can all join in the excrutiatingly slow progress. These will be very exciting to all of you, I know. 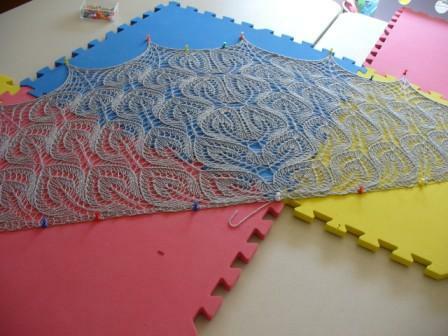 🙂 The first is after one afternoon of concentrated stitiching, the second is a couple of days later. What a difference the flash makes – sorry! Maybe natural light this weekend? I am on my fourth color. There are 30. I have learned that I can’t count. This could be endless. The crocheted sock squares continue to pile up. 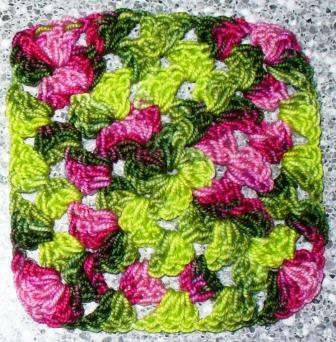 But check this out – here is an interesting thing – the skein, the knitted sock and the crocheted square. Isn’t it amazing how it can look so different depending how it is worked up? That’s all, I find the keyboard is a bit sticky to the touch, but otherwise the computer is working. Aren’t you lucky? It is FINALLY Friday, and the weather has delivered a beautiful, dry day. Sounds like we might get a whole weekend like this! Of course, it has become more difficult to tell as our satellite company and our favorite local station have decided to call it quits. Now we get pseudo-local news and weather. Kind of like Congress, they each want what they want and will not compromise. Never mind that we, the consumer, who actually pay for the service, want them to reach an agreement. Whatever. So, what will I be up to today? You know, I really am not sure how the day will unfold. A is off today, and still snuggled under the comforter enjoying a rare lazy morning. Cats and I are up at normal time, so I did a little shawl knitting, and likely will do some more crafting this morning. I should be out digging, but the mosquitoes are also out enjoying this beautiful morning. 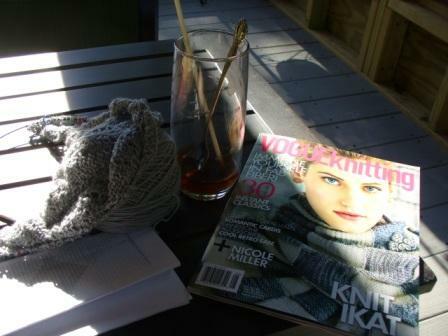 So I think I will sit with coffee and crafting on the screened porch for a bit. After all that rain the last few days, it will feel nice not to be muggy. 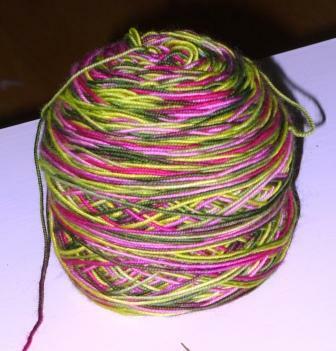 But, I can’t do that all day (I guess) so I likely will do some laundry and run some errands – which will include mailing off the craftroom giveaway prize to littleblackdogsa in South Africa; and picking up the package of yarn I hope hope hope has arrived at the PO. This evening we are going to a gathering at one of A’s co-workers, to say good-bye to another co-worker who is leaving the company. Neither of us are much fr parties, but we will make an appearance. Then, since we will be in Bangor, we will do a few things – maybe go to Staples and recycle some printer cartridges, do the grocery shopping int he great big supermarket, instead of our smaller market. And who knows what else will get done? I have finished my third full week of gluten-free living, and I have to say that as a weight loss plan, it isn’t so great. Not sure how, but I actually gained weight last week. I hope for a different result this week. I am eating so much better now, nice veggie salads for lunch, with some protein like chicken or tuna in them, and supper is simple lean meat and a veggie or another salad. I am not using lots of processed foods to replace breads(although A did make me g-f crepes last Sunday, I only had two, and filled them with strawberries) so I guess I will not worry about the weight, but focus instead on just being healthier. Other things to fill my time – make a birthday card for niece C the younger, who will be 18 in a couple of weeks. Meant to do that last week but never got to it. Worry about niece B, elder sister of C the younger, who is in the hospital undergoing all sort of gruesome tests to determine why her pancreas has stopped working. I try not to focus on all the things I foolishly read on the internet about pancreatic trouble, and just go with sending her positive thoughts. She has been there all week, and today has a colonoscopy. This is when I hate that they are so far away. Well, I always hate it, but this is when I REALLY hate it. Also, I did start the cross stitch piece, which will likely take forever – it is on 18 count cloth, and while not big (5 inches by 7 inches) it is quite detailed, with 30 colors of thread. I did a good bit last night, but did not put a dent in it. So, it is a longer term project than I thought, but I will work away at it, and it really is a lovely thing, so I am glad I am making it. And, I have to get a hold of the book I am supposed to be reading for book group, called the Rules of Etiquette, and that is all I know about it! I’ll stop at the bookstore today, see if they have it, and if not, I know they will order it for me, and it will be here in time to give me about a week to read it. Which may or may not be long enough. 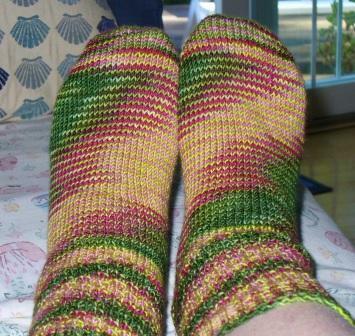 And knit a bit on socks as well. Because more yarn is arriving today! An up and down sort of day, I guess. 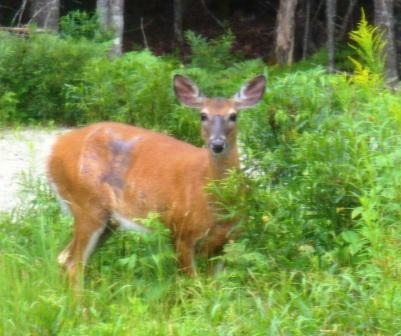 why don’t deer eat crabgrass? It is really quite frustrating that they will eat pretty much anything else that grows in this gravel pit of a yard, but the one thing I DON’T want in the raised beds, they carefully leave. Why not eat it? It’s green, it grows fast, it is tough enough to last through flood and drought. It seems their food problems could be solved if they would just eat the crabgrass instead of the tomatoes, strawberries, pansies, peas, beans…. Author salpal1Posted on July 17, 2014 Categories what I am thinking aboutTags deer, garden woes6 Comments on why don’t deer eat crabgrass? 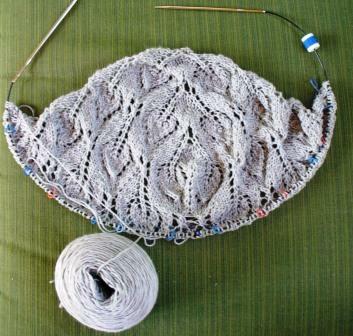 on the Gail Nightsongs shawl, which is whizzing right along. 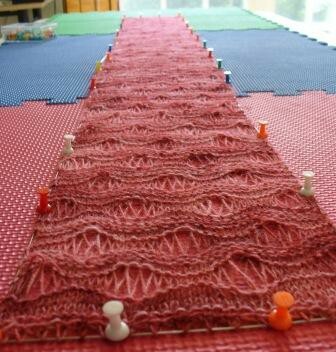 Meanwhile, upstairs, the blocked dropped stitch morning surf scarf was drying on its blocking wires. This card is one I made for niece C (the elder) last week – she got it already, so I can show it here. 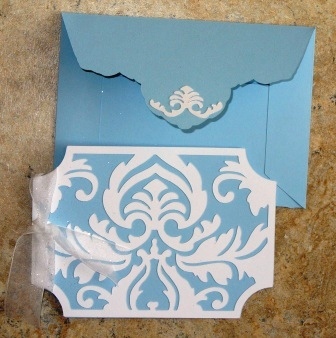 It actually was about as easy as a card could be, using the Cricut machine and Damask Cartridge. It’s the demo project they show in the book. I just loved it, and it was easy to make this pretty, elegant card. 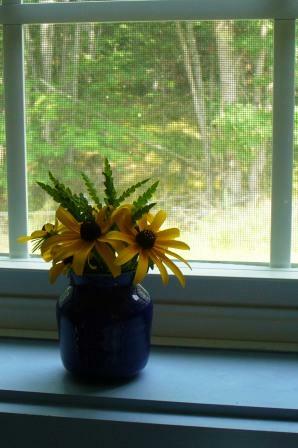 She loves light blue, and pretty things, so I hope it cheered her up while she recovers.